Whenever the corporate naming rights to a stadium, park or skyscraper change hands in Chicago, the results seem to be... less than desirable. People still refer to the Willis Tower by its former name (Sears Tower forever), we're not over the irony of Guaranteed Rate Field and there's just no way we're going to start calling the park by Wrigley Field Gallagher Way. 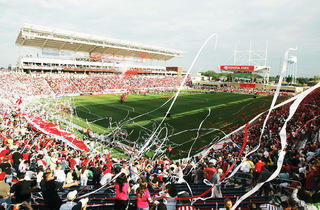 The home of the Chicago Fire, which is currently called Toyota Park, is the latest stadium to undergo a name change. When the soccer team's 2018 season ends, the field will henceforth be known as SeatGeek Stadium. 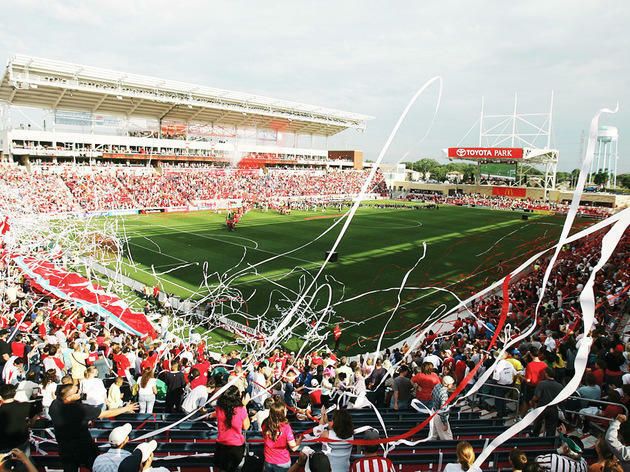 The ticket resale company is an official partner of Major League Soccer and recently bought the naming rights to the Bridgeview stadium for an undisclosed sum. According to a press release, as part of its new partnership with SeatGeek, the Village of Bridgeview will aim to bring "more live programming to the venue, including premier concerts, music festivals and international sporting events." While its location outside of Chicago city limits might be inconvenient for some, it's likely that the folks behind the stadium are trying to emulate the success of Wrigley Field's summer concert series. Of course, the name change simply signals another (inevitable?) transition in corporate sponsorship, but it's difficult to imagine someone earnestly saying "I'll meet you at SeatGeek Stadium tonight!"